At concrete and aggregate recycling sites, recycled aggregate is produced by crushing concrete and asphalt to reuse the aggregate in the construction industry as a base for roads or building foundations. 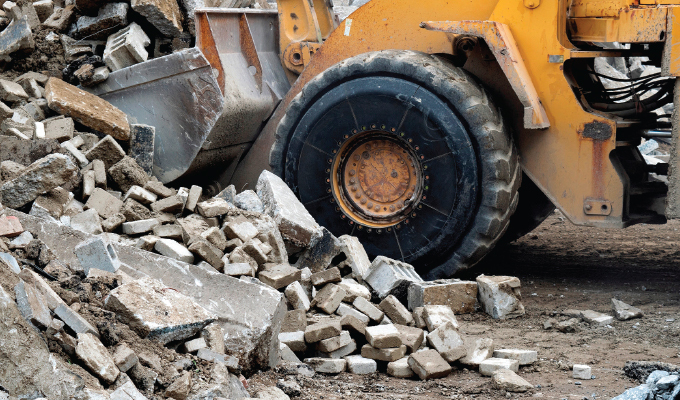 To keep operations running, site managers rely on loaders to push large jagged chunks of torn up sidewalk, roadway, or building materials—which can have steel rebar sticking out—to the crushing line to reduce its size. Even though OTR tires for heavy equipment are specially designed for harsh environments, the risk for damage is still high. One of the most common failure points is the tire’s sidewall. Without added protection, the jagged edges and steel rebar in piles of debris can put loaders’ OTR tires at severe risk of sidewall puncture and abrasion, particularly the front tires closest to myriad sharp, abrading objects. 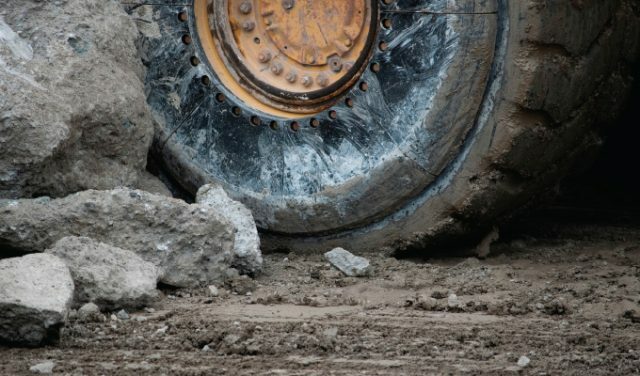 Fortunately, for operations managers, a new breed of tough, durable sidewall protection for OTR tires is designed to stop loader sidewall punctures and abrasion while significantly extending tire life to keep aggregate recycling operations reliably running. Research by the Mechanical Engineering Department at the University of Alberta in 2011 on the detection of faults on off-road haul truck tires identified five tire failure areas: tire tread, shoulder, sidewall, bead, and liner. The study cited research by Syncrude Canada Ltd that examined the causes for off-road tire failure from 2005 to 2010. Sidewall cuts accounted for approximately 18 percent of all faults, sidewall separation 10 percent, and sidewall impact more than 5 percent. When the sidewall is damaged in loaders, typically by a puncture, the vehicles are not safe to operate and the OTR tires are expensive to replace. Caterpillar 980 Wheel Loader OTR tires, for example, can cost up to $6,000 or more each. Repairing a damaged sidewall takes valuable time to send a tire out for repair, and the repair may not be successful. 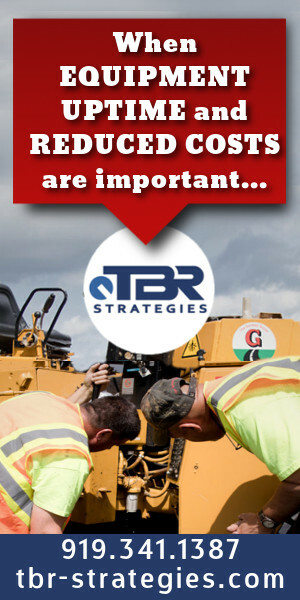 So, an aggregate recycling operator faces a sidelined loader, expensive tire replacement, and reduced production or even significant operational downtime. With shortages for certain tire sizes more common recently, it could take days or longer to get a replacement tire installed at a repair facility, and then get the loader back to work. As a solution, an innovative new type of sidewall protection device is entering the market for valuable OTR tires. Purpose-built for use on heavy equipment at aggregate recycling sites, operators can bolt on a polyurethane sidewall shield to prevent the sidewalls from getting punctured during operation. A Michigan-based firm, Argonics, which specializes in high-performance, polyurethane-based elastomers and is one of the largest producers of impact, wear-resistant and customizable urethane products, has developed this sidewall protection. Their sidewall protector uses a proprietary urethane formulation called Kryptane, which was engineered for extreme wear conditions involving abrasion, sliding, or impact. The special properties of urethane make it an excellent material for sidewall protection. This tough, elastic material excels in preventing the penetration of sharp objects, as well as deflecting them. It will change shape under impact and then return to its original shape afterward. Urethane also offers maximum abrasion resistance, which is ideal for situations where severe wear is a problem. For these reasons, urethane is already being used at mining, heavy construction, and aggregate recycling sites across North America. The idea for applying the special properties of urethane for off-road sidewall tire protection came from Perry Fell, territory manager at Luff Industries, a Canadian distributor of Argonics. He thought Argonics’ expertise in high-performance polyurethane elastomers would be well suited to an OTR application, and proposed the original design. The benefit of this design is that it allows easy replacement of just the segment of the protector that is damaged, if any, not the entire shield. Virtually no maintenance is needed other than to retorque the bolts after 15 to 20 hours of use—much like when installing new tires on a car. The urethane-based sidewall protector has been tested at aggregate recycling sites in Toronto, Canada, and Dallas, Texas. 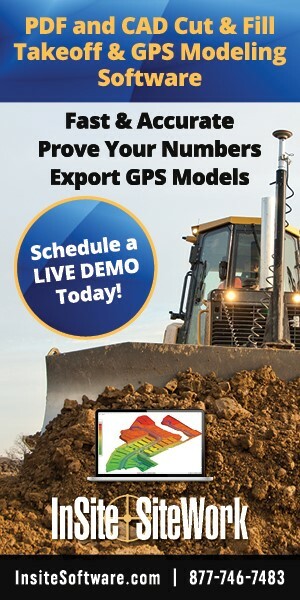 It has been installed on the front tires of Caterpillar 980 loaders at these sites. Sidewall protector has performed well in harsh environments. According to Welker, the patent-pending urethane sidewall protector is in its fourth generation. 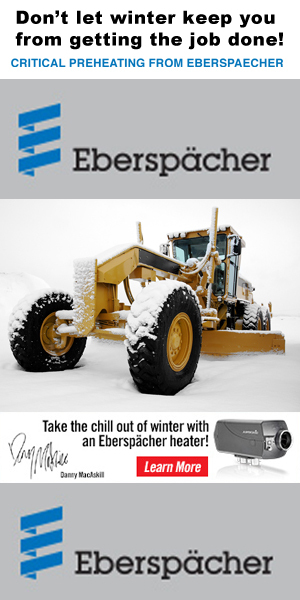 Currently, the design is based on a 25-inch wheel diameter used by loaders such as the Caterpillar 980. The company is planning sidewall protectors for 33-inch and 45-inch wheel diameters next. For more information about Argonic’s sidewall tire protection, visit www.argonics.com.